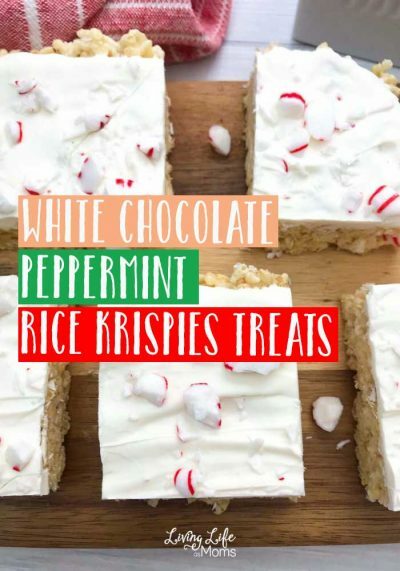 I love how you can change up Rice Krispies treats to make them suitable for any holiday. 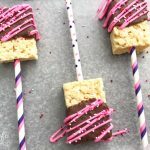 These Valentine’s day Rice Krispies treats would be a wonderful treat for any loved one in your life. I love Valentine’s day because you can whip out the pink, red, and white sprinkles to decorate any treat like cupcakes, cookies, and cakes. It’s the perfect way to express love for everyone in your life. Bake them a special treat and the surely will surely feel the love you have for them. 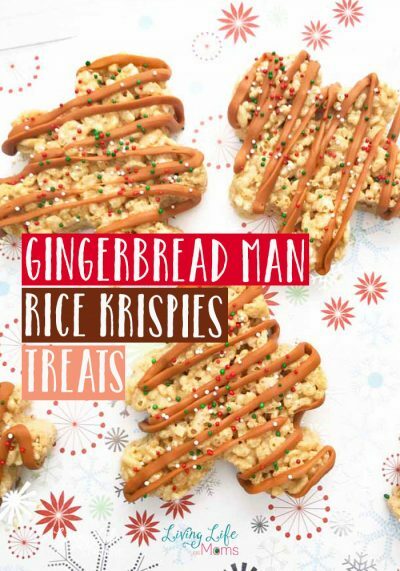 These Rice Krispies treats used ready made Rice Krispies treats but you could make your own as well. Adding your own decorative straws really dresses up your dessert for any occasion. All you need is two microwave safe bowls, a sandwich bag and scissors along with the Rice Krispies and chocolate. You can switch out the colors of the candy melts to make it festive for any holiday, like orange and green for St. Patrick’s day or red and green for Christmas. My kids would totally be happy if I just left them with only chocolate on them. Heck, they’d appreciate the Rice Krispies on their own. 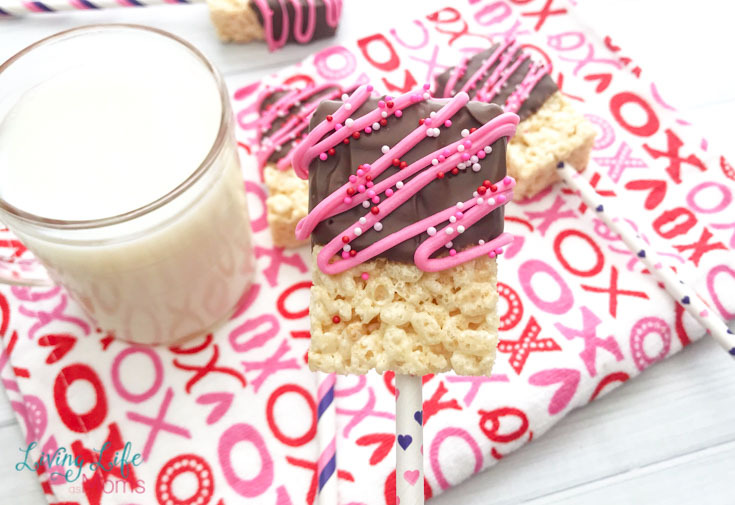 This recipe makes 8 Valentine Rice Krispie Treats, pair it with a glass of milk and you have the perfect treat for Valentine’s day. These treats always go quickly in our house, no leftovers. Insert the straws into the base of each Rice Krispie Treats. Place the treats on the baking sheet and allow them to set in the fridge for 20 minutes. 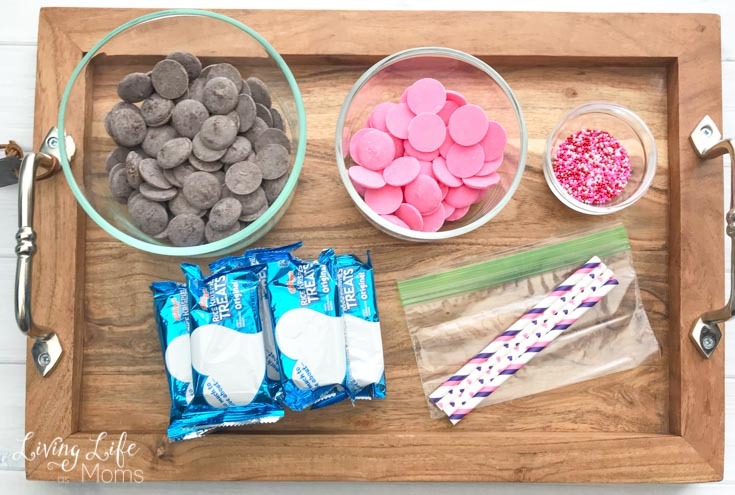 Place the Wilton chocolate candy melts into a microwave-safe dish. Heat them in the microwave in 30 second increments, stirring occasionally until melted. 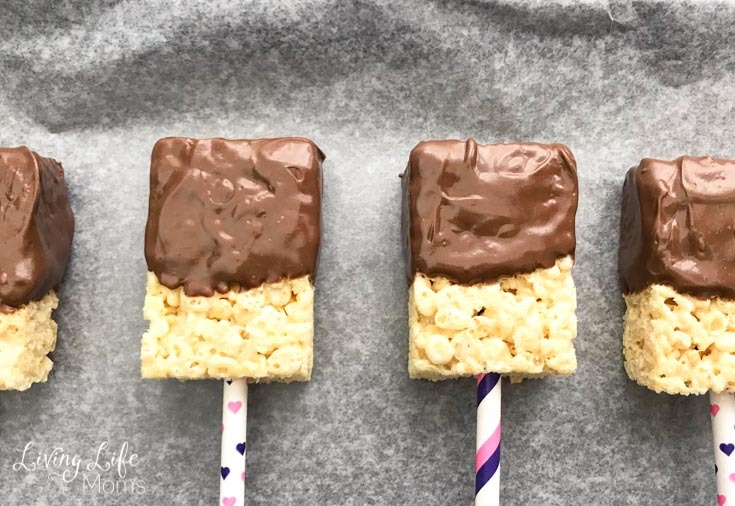 Take the Rice Krispies treats out of the fridge and dip them into the melted chocolate coating half the treat. Use a spoon if needed. Place the dipped treat onto the prepared baking sheet and repeat with the rest. Allow the melted chocolate to set. Place the Wilton bright pink candy melts into a microwave-safe dish. Heat in the microwave in 30-second increments, stirring occasionally until melted. Let cool a few minutes and place the melted chocolate into the sandwich bag. 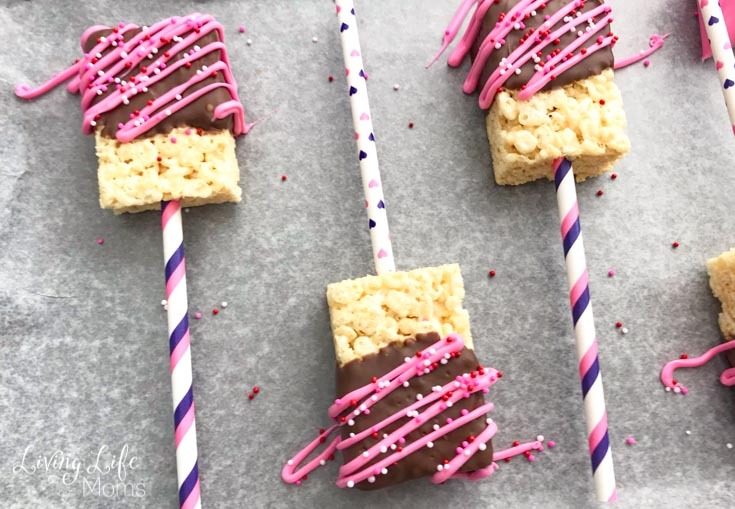 Snip one small corner and drizzle the pink chocolate onto the Rice Krispie Treats. Sprinkle the treats with the Valentine sprinkles. Allow the chocolate to set and enjoy. 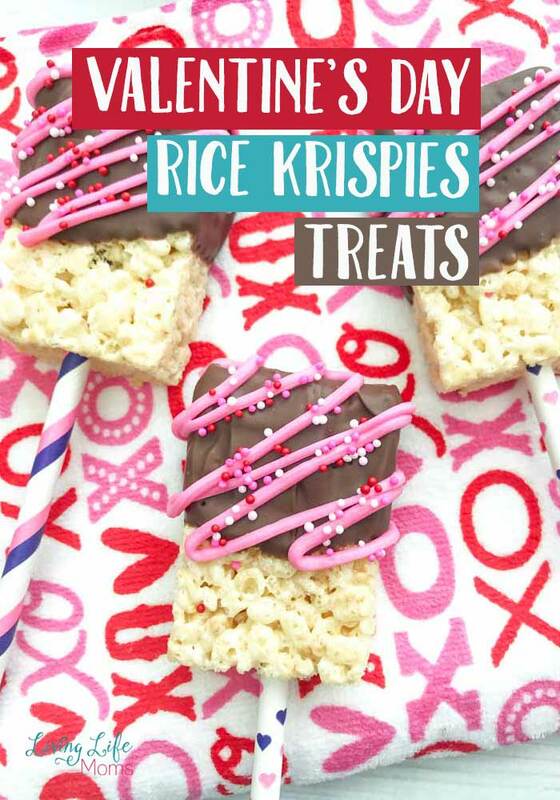 Show your family how much you love them with these yummy Valentine’s day Rice Krispies treats, they’ll be a huge hit. 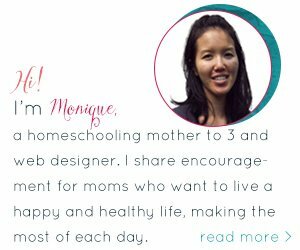 « Teach Internet Safety to Kids – Have you Talked to Yours?